By @SimonCocking. Great interview with Irish Tech News contributor Terence Mauri, more here. Terence’s new book is an interesting insight into challenging common ideas of how to lead. Times have changed and what may have worked in the 20th century for large companies is no longer the best option here in 2016. In this piece we interview Terence about the book ahead of it’s forthcoming launch. The book is available for pre-order here. A few years ago, I was lucky enough to visit Facebook. Its HQ is built on the former site of tech leader Sun Microsystems, which was sold to Oracle in 2009 for $7.4bn. When you arrive there’s a giant poster of the iconic Facebook thumbs up that is actually on the back of the Sun Microsystems sign. Sun was once a $200bn company with the most talented minds in tech. I asked myself, what stopped its progress and why are more companies dying younger? This was the catalyst for researching the book. You describe that the model for leadership is changing, how wide spread is this, and across which industries? There’s a big gap between knowing and doing and so it’s not as widespread as it needs to be. I hope the book will help start a conversation in companies about how to change. Companies are realising that if you don’t disrupt the status quo you might become it. Disruptive forces and the speed of change have created tremendous risk but also tremendous opportunity. One of my favourite facts is that it took the telephone 75 years to reach 100,000,000 users and the messaging app, What’s App just 3 years. The best entrepreneurs realise that old models of leadership have become outdated. For example, Jeff Bezos, CEO of Amazon has introduced the two pizza rule for meetings. Now, meetings are only be for 6-8 people (enough to share two pizza’s); and no meeting is compulsory. Simple changes but incredibly empowering for employees who want to do great work. In my research, I discovered that startups and tech companies are in the vanguard of disrupting the way leadership is done. There’s a paradox for the biggest companies as they often end up spending more time looking inward to protect their past rather then changing to stay ahead of incumbents. A key message in the book is that you will need to change your business model multiple times to thrive in the age of disruption. The bad news is that you’re probably not going to learn this at business school. How soon do you think / hope it will become widespread? I hope sooner rather than later. Today’s problems cannot be solved with yesterday’s thinking. I recently met the legendary Sir Michael Morritz from Sequoia Capital and author of Leading at a ‘Books 4 Breakfast talk (www.bookomi.com) hosted by Bookomi founder, Richard Kilgarriff. I remember him saying the most important factor for success is a winning culture. At its best, it’s an energiser. I fear that without the right culture, some of the biggest companies on the planet will fail to upgrade their leadership models quick enough to survive. We loved the book but it it is quite short, was this intentional? Thank you! The answer is yes. I wanted to write a book that was long enough to explore a powerful idea but short enough to read in a single sitting. We’re all so busy! I’ve always been a big fan of TED Talks and best selling authors such as Seth Godin (Tribes: We Need You To Lead Us) and Margaret Heffernan (Beyond Measure: The Big Impact of Small Changes) who are brilliant at crafting short stories to spark the imagination or change the way you think. 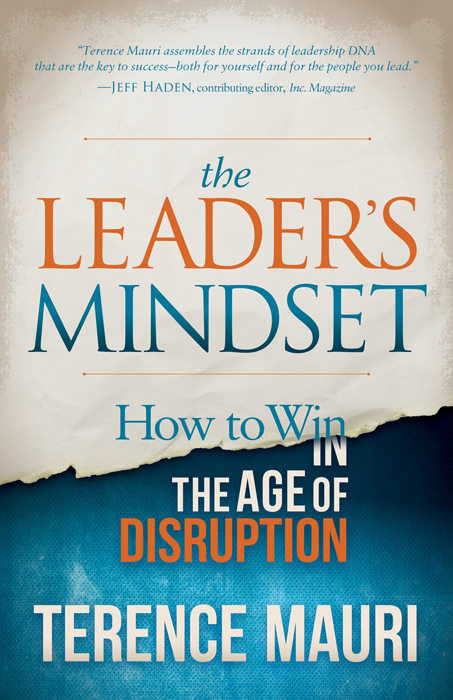 I hope The Leader’s Mindset: How To Win In The Age of Disruption achieves the same outcome. I’ve got some exciting projects coming up including a book talk at Home House in Portman Square, London (www.homehouse.co.uk) and a book tour in the USA later in the year. I also plan to support a great charity, Room To Read set up by ex-Microsoft leader, John Wood who wrote the inspirational book, Leaving Microsoft To Change The World. Definitely. I have an Irish Italian background and my grandfather on my mother’s side was from Cork. I will sign off with ‘may the luck of the Irish be with you’!